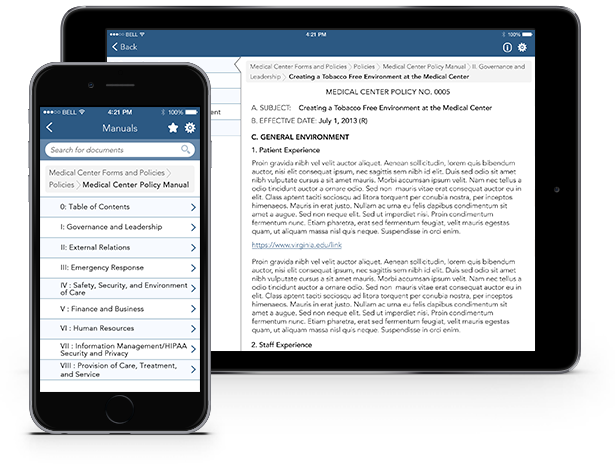 UVA Document Management app (for iOS and Android) is another example of how our Innovation and Quality streamlines day-to-day lives and routine processes for many people. 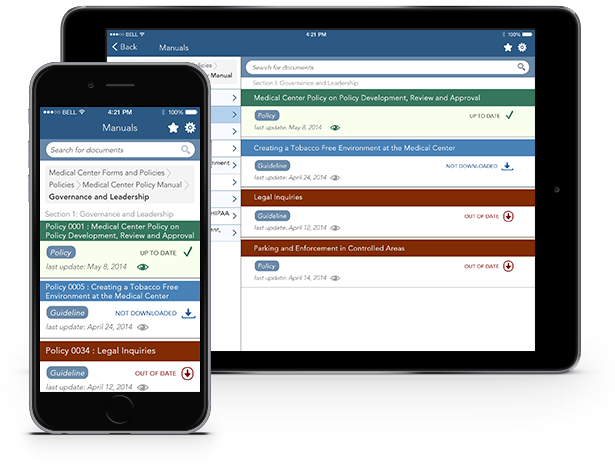 UVA (University of Virginia) employs thousands of people, who are legally obligated to be up-to-speed on many policies and guidelines. This includes medical staff (e.g. nurses at training hospital), residents, interns, visiting doctors, etc. The old-fashioned process (via paper manuals, pdf docs, emails, web repositories), was a nightmare, primarily because many of these folks do not sit in front of a computer. We have proposed a system that keeps those documents on their mobile devices, and provides easy ways of accessing them. In addition to viewing, reading, and browsing documents, users are able to set bookmarks, identify relevant and irrelevant information, receive notifications when documents change, work offline (even when there is no internet connectivity), set up their own preferences, specialties and interests. We have brought Innovation and Quality into this project and turned an outdated process into a very efficient experience.